We offer in-truck training, with real driving time and flexible truck training hours. Join us for customized, quality truck training in a friendly and comfortable atmosphere: you can book an appointment by email or phone (780-668-9799), or fill in the form below if you want us to contact you. If you’d like us to contact you about upcoming truck training and safety courses, please fill out the form below. We don’t accept registration online, but we can contact you with the next available course dates that you’re interested in. Please use this form to provide your contact information and let us know what information you’re looking for. We will call you or reply by email, whichever you prefer. 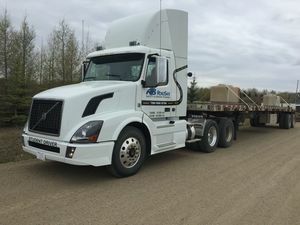 AB Roadsafe proudly offers truck driving training services in Edmonton, Ft McMurray, Edson, Hinton, Slave Lake, Drayton Valley, Athabasca, Sherwood Park, and surrounding areas. Please specify which course/courses you are interested in. If you are unsure of what course you need to take please specify what job you are looking for. This way we can advise you on what the standard requirements are to pursue that occupation. Refresher Class 1 or 3 Air Brakes classes I'm Not Sure What I Need! What Occupation are you looking to pursue? Fatigue Management I'm Not Sure What I Need!